Building on the sparse arrangements and "a novelist's eye for detail" (Uncut) cultivated over the past several years, the group's greatly anticipated third album is replete with vital lyricism and galvanising rhythms. Sparkling electric guitar jangles pull against the unique thrum of Fullbrook's acoustic as the cryptic poetry she is known for rings out. Comprising a taut and agile quiver of songs, the record - set for release on February 1, 2019 - dances with explorative instrumentation and a buoyant pop sensibility that fizzes with life. Hollie Fullbrook is no stranger to acclaim. Debut LP Some Were Meant For Sea (2011) saw her name on billboards, playlists and blogs worldwide. The album's clutch of "gorgeous vignettes" (BBC) put the artist on the map, and she took to the road from her home in New Zealand to tour extensively through the UK, Europe and North America - a passage repeated many times since. Second album Brightly Painted One earned more accolades, championed by the New York Times, NPR and David Lynch, and winning Best Alternative Album at the New Zealand Music Awards in 2014. "An album of quiet, devastating beauty," wrote PopMatters.The album saw Fullbrook join forces with producer Tom Healy, whom, alongside long-time tourmate bassist Cass Basil and drummer Alex Freer, Fullbrook has worked and toured with ever since. While spanning continents, Tiny Ruins won fans in critics, crowds and became a sought after collaborator. A New York recording session culminated in the EP Hurtling Through (2015) with indie-rock legend Hamish Kilgour (The Clean), while 2016 single 'Dream Wave' was recorded and produced by award-winning cult filmmaker and musician David Lynch. Headhunted by Lorde for the Hunger Games soundtrack blueprint she curated, Fullbrook teamed up with legendary filmmaker Lynch for the collaboration. "A tranquil, pared-back track [with] a gradually rising sense of the macabre… very special indeed." (Line Of Best Fit). 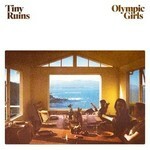 Early 2019 will see the release of album three - Olympic Girls. Patiently built in the same underground lair as Brightly Painted One,the album was made over a drawn out period of spontaneity and experimentation, stridently reaching beyond Fullbrook's formerly minimalist domain. Production from Tom Healy and Fullbrook is exercised with muscular aplomb; marrying the intricately woven poetics of Leonard Cohen, the shimmering dream-pop landscapes of Beach House or Mazzy Star, and the off-kilter experimental pop of Broadcast or John Cale. Exhilaration persists throughout the record as Fullbrook commands a series of songs marrying the ordinary with the outlandish, the metaphysical with the mundane. Every track is coiled with the potent energy of a band enraptured in performance, while Fullbrook's lithe voice slips between characters with a gentle yet urgent fluidity rarely seen in the climate of modern music. A sardonic humour is laced throughout as Fullbrook explores the absurdity of a life travelled in song.